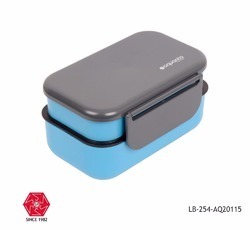 Leading Manufacturer of silicon lunch box collapsible meal kit of 3 compartment -lb-355, lunch box-lb-250-aq20104 blue, silicone lunch box foldable-lb-354, silicone lunch box foldable-lb-353, silicone multi-purpose lunch box-lb-351 and lunch box-lb-251-aq20105 from Mumbai. Make your serving and storing interesting and attractive , it is made from the softest, safest and 100% food grade silicone, which means no BPA. These containers are extremely good space savers. It is made to hold anything from a sandwich to last night's leftovers. Now it's easy to "go green" by using this reusable waste-free lunch system. Simply compress it to 1/2 of the size so that it is easy to carry and store when you are done.This colorful and attractive folding box is perfect for school, travel and day out! Color Blue, Blue Green, Grey, Red & Yellow. 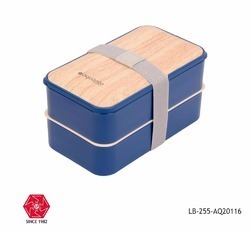 High quality plastic keep warm lunch/food for long duration. Non stick finish and easy to clean. Airtight and convenient for home, office, travel and sports. 5. Compatible and best use for office and School. 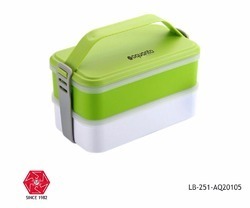 This colorful and attractive folding box is perfect for school, travel and day out! Color Blue, Light Blue, Purple, Light Purple, Green, Red, Pine Green & Sky Blue. Birthday Return, household Corporate Gifting. Perfect for Office School Use.